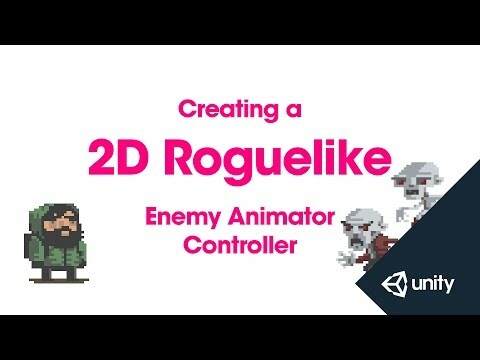 This is part 11 of 14 of the 2D Roguelike tutorial in which we set up the Enemy Animation controller and add code to the GameManager to manage the enemies. game manager to manage and move our enemies. Let's start with the animator controller. and open our animator controller Enemy1. as we did in the player. We're going to label this EnemyAttack. in the list of conditions. Since there's only 1 parameter Enemy1Attack will be added. We're also going to adjust the settings for this transition. when it's time for the enemy to attack. because we want to transition at the end of the animation. We'll also set the transition duration to 0.
at the bottom of the screen and test the animation. we don't need to do this twice. This same state machine will be used for both enemies. and open our Game Manager. and initialise it to 0.1 seconds. This is how long the game is going to wait between turns. which we're going to use to keep track of our enemies. of Enemy classes called enemies. enemies to equal a new list of the type Enemy. enemies when the game starts using enemies.Clear. and we need to clear out any enemies from the last level. one at a time in sequence. in this case 0.1 seconds. which would be the case in the first level. even though there's no enemy that they're waiting for. the MoveEnemy function in our enemy script. and enemiesMoving to equal false. we're going to call that from within update. meaning the enemies are already moving. and not execute the following code. that returns void called AddEnemyToList. and parse in our parameter script. And that's all we're going to need to do for now. Let's save our Game Manager and return to the editor. we're going to make 2 small additions to our Enemy script. our list of enemies in Game Manager. in the animator controller that we setup. Let's save our Enemy script and return to the editor. choose Component - Scripts - Enemy. and we're going to define the PlayerDamage variable separately. and Enemy2 is going to do 20. Let's play our scene and give it a test. And so so far everything is working nicely. is playing when it should.